* Constructed of solid maple framing and reinforced with 13-gauge steel corner braces. * Two-piece split top make of 3/4" almond colored plastic laminate, and equipped with soft close feature and a pencil stop. 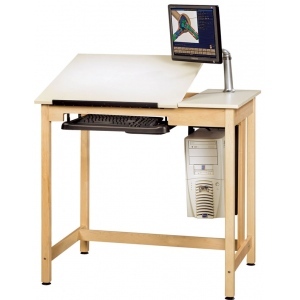 * The table top is split into a 30"w x 30"d adjustable side and a 12"w x 30"d flat side. 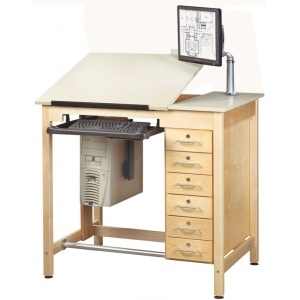 * Also includes a CPU storage compartment, a monitor arm, keyboard tray, mouse tray, and cable manager.